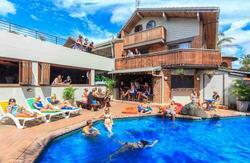 Backpacker Holiday Village is a unique open concept hostel, centrally located on the main street of Byron Bay, and only a short walk or bike ride to Byron Bays beautiful Main Beach, Wategos, Clarkes, and The Wreck beaches. Jonson Street, the main street in Byron Bay, offers a wide range of retail shops, restaurants, bars and cafes, all of which you can stop on the way to and from the Holiday Village. Open your door and step into the action; it is at your fingertips! Our unique layout promotes and encourages social gathering and the independence to live the Aussie lifestyle the way you imagined! The facilities we offer are designed to make your stay as complimentary as possible. Being the only hostel in Byron Bay to offer the free use of surfboards, body boards, and bikes you can fill each day getting intimate with the local scene, a culture of great surf, cruisy afternoons and an abundant nightlife! You're allowed to feel a little cheeky, so experience Cheeky Monkeys, a world renowned backpacker bar located directly across the road from Holiday Village! Getting acquainted with Byron Bay begins at the hostel. Accommodation at the Holiday Village was created for your tastes, offering 4-6-8 share dorms, double and private rooms, and en suite options. Sounds great, but you're looking for something more personal? Thats ok, we also offer self contained apartments that transform a hostel experience into a more comfortable escape. We pride ourselves on creating a short term home for the traveler that wants to fully absorb our way of life! The amenities you may also enjoy are our Extreme Travel tour desk, to book any of your adventures, the pool and spa in the center of the hostel, volleyball / basketball courts, and the BBQ area; this is where all good meals, good conversation and great nights begin! At the start of your travels here in Byron Bay, it is important to choose a place to stay that fits your expectations. You are the traveler and we are the experience, so come in, say hello and join the family at the Village! 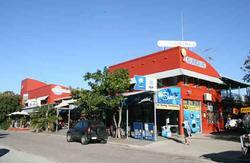 Backpackers Holiday village is the only hostel located in Byron Bay's main street. Located in the centre of town & only 250 metres from the bus stop, next door to the cinema and across the road from Cheeky Monkeys nightclub.